Sharing our thoughts and ideas with friends is so important to all of us. I recently discussed an Amy Tan book that I had just finished reading with the members of my small book club. After reading the book, I thought that I had a pretty solid interpretation and opinion of the story but during our discussion, I realized that there were many aspects of the text that I hadn’t even thought about. When I got back home, I went right back to the book to reread particular passages that my friends referred to in our conversation. I needed to revise a bit of my original interpretation and assessment of the book! Children too need time to share their discoveries, their artwork, their constructions and their dramatic play experiences. After Choice Time, it’s so productive and supportive of children’s ability to listen and respond to others experiences and ideas if we leave time for a group share meeting. Perhaps something unexpected or exciting happened at the art center or an exciting discovery was made at the water table. Was a new math game invented at the math center? When the children and teacher meet for post-Choice Time-share children might be encouraged and enticed into choosing an activity the next day that they hadn’t previously considered trying. We are also reaffirming by sharing peer examples the idea that, during Choice Time, we honor and encourage innovation, collaboration and exploration. As my good friend, Julie Diamond, wrote in a note to me, interest in trying new centers “can be further expanded when teachers find places in the room to display work after the meeting – time discussion”. In some ways, Choice Time follows the workshop structure that is used by the Teachers College Reading and Writing Project. We begin at a group meeting with a brief ‘minilesson’, then the children have time for their ‘independent’ play and explorations, and we bring closure with our share meeting. It’s absurd to have to justify exploration and play for young children. However, if you have difficultly ‘justifying’ this very important part of the early childhood curriculum, you could call it “ Investigative Workshop” or “Exploration Workshop” instead of Choice Time. If that’s what it takes to make it work for you, go for it! 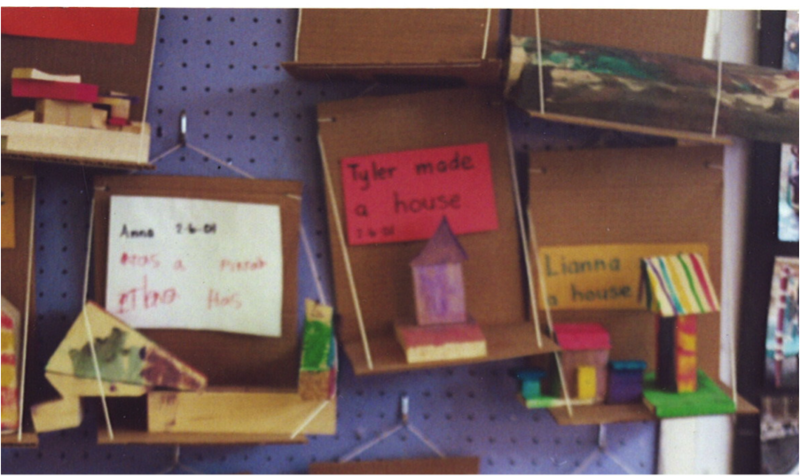 This entry was posted in Investigating Choice Time: Inquiry, Exploration, and Play and tagged Choice Time, Connie Norgren, exploration, innovation, Investigative play in early childhood, Julie Diamond, sharing, workshop on October 25, 2010 by Renee. I’ve had some difficulty writing an entry this week because I’ve been rather depressed about the state of kindergartens in New York City schools. It’s becoming a cliché to say that they are becoming more and more like first grade but there does seem to be a lot of truth to that thought. When I speak with administrators who have had Bank Street early childhood training, who understand how important play, inquiry and opportunities for social interactions are for young children and who STILL eliminate all opportunities for this to happen in their schools, I really do wonder what is happening? Why isn’t choice time and inquiry a priority for kindergarten classrooms? Perhaps it has to do with the way that Choice Time is interpreted. I’ve been wondering about how my idea of Choice Time differs from what I’ve been seeing when I visit many kindergarten classes. I always tried to encourage children to ‘think of the possibilities’. What can happen at this center? What’s the potential for these materials? What might we add to the center to broaden the potential? What center just isn’t going anywhere and what should we do about that? Should we add new materials? Should we just pack up the center and move on? This was often a topic of discussion that I had with the children. Sometimes we charted ideas – (i.e. Here Are Some New Ideas for What We Might Do At the Sand Table). Other times, it was just an informal discussion that we had at meeting or among the participants at a particular center. I don’t mean to imply that every Choice Time center, every day, was an earth-moving experience for the children or for me. What I am saying is that I always encouraged children and myself to think about how we could have new ideas about how to use materials and how the addition of new materials changed what children could do at a center. Don’t we want children to become thoughtful, inquisitive readers, writers and mathematicians? Isn’t it logical to support these behaviors through play and exploration at Choice Time? This entry was posted in Investigating Choice Time: Inquiry, Exploration, and Play and tagged Bank Street, exploration, inquisitive, kindergarten priority on October 19, 2010 by Renee. 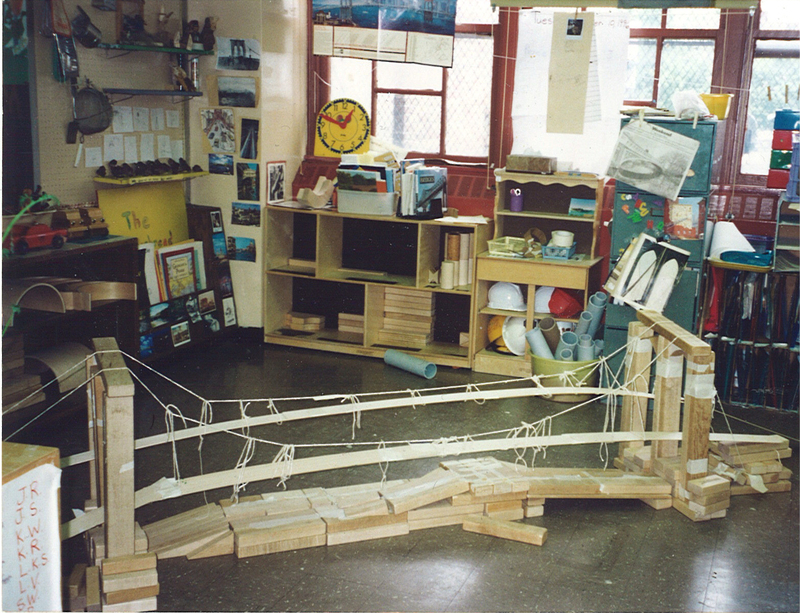 My kindergarten class was studying bridges and because of their interest in the topic and the multitude of questions that kept coming up in class, this became, surprisingly, a yearlong project. We visited many bridges, returning to sites to answer questions and get more information. As the study progressed, the construction of bridges in the block center became more and more elaborate. 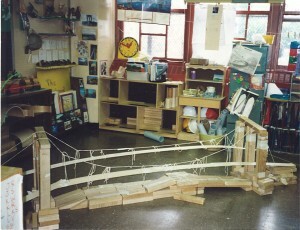 It seemed as though the space allotted in the classroom for block building was becoming too limited for their elaborate suspension bridges and often-collapsing moveable bridges. I began to notice that the “Pretend” center, abutting the block center, was empty each day. Nobody was picking this once very popular activity at Choice Time. I thought that this might be a time to pack up that center and extend the space of the block center, allowing for bigger constructions and for more children to work together in this center at one time. I presented my observations the idea for eliminating the dramatic play center to the children at our next class meeting fully expecting a unanimous agreement. No! The children were unanimously AGAINST this plan! “What about making the Pretend Center smaller and the block center bigger?” Sarah asked. “But” I wondered out loud, “What could you play in a small pretend center?” “A store, “ Zeke suggested and excitement broke out. “Yes, yes, yes, let’s make a store!” What had I unleashed? I hadn’t anticipated this turn of events! What ensued was two days of discussion at our class meetings about what kind of store could work in a small space. One child suggested that it could be the kind of store that the neighborhood has on the streets in the weekend. A stoop sale! At last, the decision was made to have a small bookstore. I said that if we were going to turn the pretend center into a bookstore, then we needed to do some research, so we arranged to visit a local bookstore. On our field trip the children drew the inside and outside of the store and interviewed the workers and storeowner. We bought an ABC book to add to our class library. What followed were a few weeks of bookstore preparations. 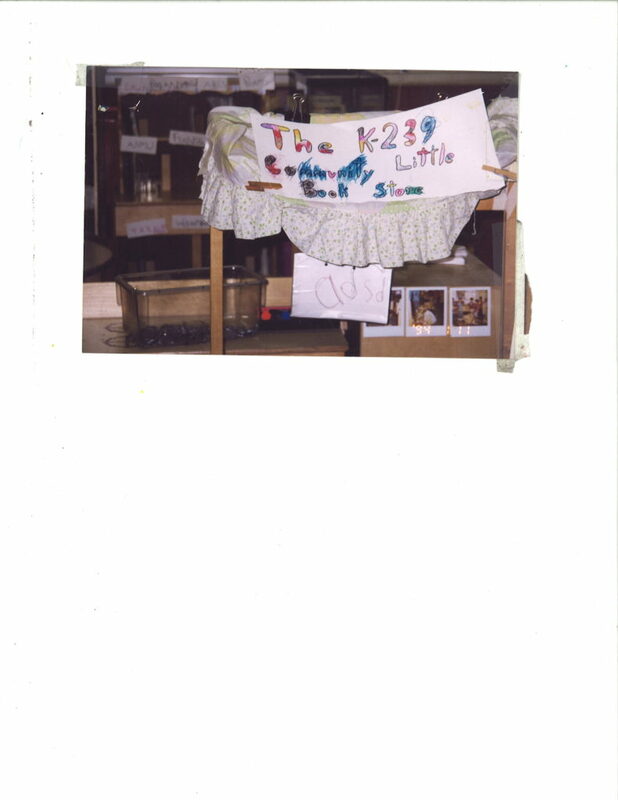 (Connie Norgren, a colleague, came into our classroom during one of our class discussions and she jokingly said to the children, “If it’s a little bookstore, maybe you should only have little books.” The idea caught fire immediately and hence K-239 Community Little Bookstore was born. 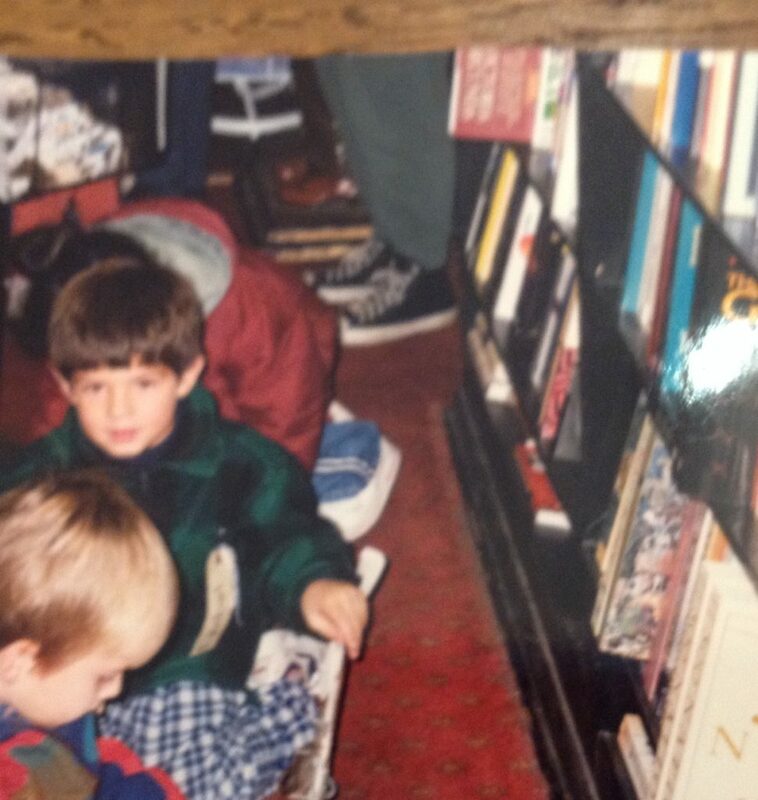 During the following exciting and busy time, many of the Choice Time centers became places where children were involved with bookstore preparations. Block Center In the block center, the children switched from building bridges to building a bookstore. It was, at first, almost as though they were using the blocks to create a map of the Community Bookstore. I supported this work by taping up photos of the bookstore from our trip and also hanging up some of the children’s observational drawings. The store that we visited had recently added a small café and so a basket filled with cups, plates, utensils and fabric was added for the café. Paper, index cards, post-its, tape, pencils and markers were also available in this center so that signs, labels, menus and other print and pictures might be created. Although the Pretend Center was not in use, the addition of the café seemed to create a dramatic play environment in the block-building center. Book-making Center: Because the children decided to only have little books in the bookstore, we set up a center where they could make small books to add to the bookstore collection. We had recently been looking at ABC books in our reading centers and the children seemed particularly interested in writing tiny ABC books for their store. I asked them what they might need at this center and they came up with this list: little blank books with enough pages for the whole alphabet (I prepared these), some ABC books for them to look at, dictionaries (we had a nice collection of picture dictionaries in class and the children loved looking through these) and abc charts. I also added paper and a small stapler in case they wanted to make their own booklets. Sign Center: Children in this center made signs and labels for the store. 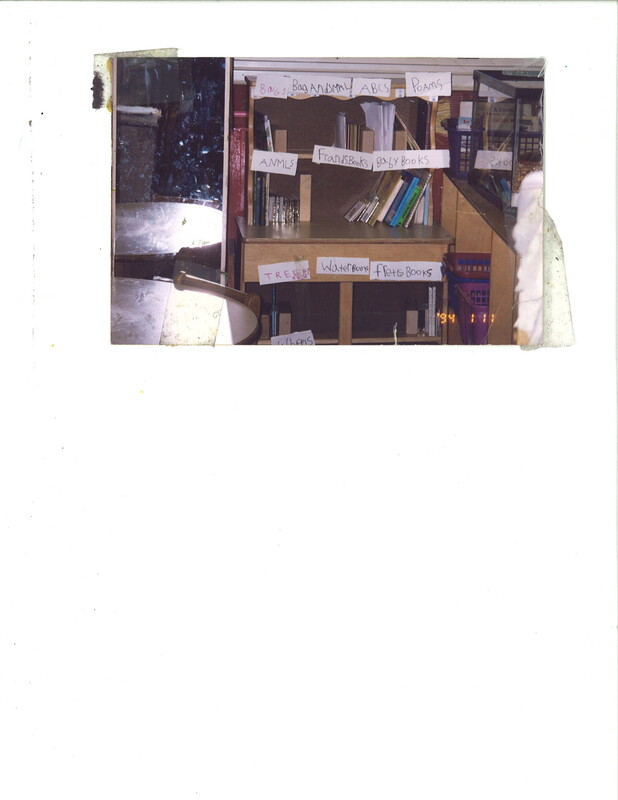 They made labels for different sections (they decided on the categories after looking through the books that had been collected and sorted), made a sign with the hours of operation, and they made a big, colorful sign with the name of the store. On our trip, the noticed that the store had an awning and so they constructed one using fabric from the art center and a wooden structure that previously served as a puppet theater. I didn’t need to provide a lot of materials for this center. I left some photographs from our field trip, some trip papers where children had recorded some of the store signs, paper, blank index cards, markers and crayons. At the start of center time, I met with this group to review what signs had been made the previous day and to generate ideas for signs that were still needed. This was a very popular center! Library: Children looked through our classroom library for ‘little books’, which they then sorted into different categories. I provided small plastic baskets that they could use to sort the books. The children at the bookmaking center brought their books to these children so that they could be added to the collections. Construction Center: A cash register was constructed and paper dollars and tin foil coins were cut out and ready for the opening of our new business. First I joined the children to look at photos of cash registers and together (shared drawing!) we made a design for one that they could build. I provided an empty carton along with the photos. The children worked near the art center so that they could get materials that they needed. During choice time, there were some centers that did not have anything to do with our bookshop preparations. The sand table was still open as was the math and science centers. But for the few weeks of bookstore excitement, many children chose to pick centers connected with the bookshop, whether it was building, constructing, writing, drawing and painting, determining prices for books that were for sale (nothing more that 25 cents) or sorting books in the library. There was a definite “bookstore buzz” in the room during Choice Time. When the store finally opened, we invited another kindergarten class to visit and buy books. Our 4th grade buddies came and we also opened the store to families on Family Friday morning. The children were all excited to talk about all of the different parts of the store and how they built it. However, after about a week of ‘playing bookstore’, interest waned and the bookstore was closed. We returned to the bridge study. Interestingly, there was now a renewed interest in the Pretend Center, which reopened in its original space. Although it looked just as it did before the bookstore study, it became a choice time center where children were able to play and explore with a new and fresh perspective and with invigorated interest. The teacher’s role is important in allowing this type of exploration to unfold. The teacher almost becomes an improviser, who can listen carefully to children and understand how to use their questions and comments as an impetus for introducing new projects and investigations. It’s important, however, not to jump quickly into a curriculum detour, but rather to give time for children’s’ ideas ‘percolate’. This will help the teacher determine if the enthusiasms are momentary or if they are interests that will withstand an in-depth exploration. I’ve only described one example of how Choice Time and inquiry study can overlap, opportunities for using literacy skills can be integrated into children’s play, and how the interest, energy and enthusiasm of the children can unexpectedly ignite an interesting class inquiry project that works its way into Choice Time exploration and play. This entry was posted in Investigating Choice Time: Inquiry, Exploration, and Play and tagged improvisation on October 12, 2010 by Renee. Returning home from a school after discussing what is and is not ‘art’ with a group of teachers, I asked my husband, an artist, how he would define art. After a bit of thinking, he said “an intensely personal, charged, poetic and transcendent response to life”. In my discussion with the teachers, I said that to me, art represents an outlet for a unique and personal form of expression. When my daughter was four years old, my family moved to Rome, Italy. The wife of the director of the American Academy very highly recommended a local nursery school, so my husband and I eagerly went to check it out. Everything was spotless and cheerful-looking. The walls were covered with children’s art – but all looking the same! Something was very wrong with that picture! We quickly said “thank-you” to the teacher and rushed outside, not knowing if we should laugh or cry. Luckily, we soon discovered a lovely school right near our home, where my daughter happily painted, drew, sculpted with clay, and returned home beautifully messy and full of stories about her day. Now, more than thirty years later, it disturbs me when I go into classrooms and see walls filled with identical images of flowers, with pieces of colored paper pasted onto a teacher-made flower template, decorated ‘bubble letters’ representing a so-called artistic approach to learning the letter of the day, or row after row of colored-in worksheet pictures of farm animals. What do children take with them from this type of experience? Why is it that teachers still feel the need to control the outcome of what children produce when using paper, paste, glue, scissors and crayons? I’ve been told, on some occasions, that this type of activity is planned because it teaches children how to use scissors and to color inside the lines. In discussing my thoughts about this type of proscribed activity with a wonderfully eager, yet anxious, teacher, I presented an alternate lesson for supporting young children as they learned to master the use of new art materials and tools. I suggested that children might each pick a square of colored paper and also be given a scissor. Before giving out the materials, the teacher would model how she cut squiggles and shapes from her own paper and also how she could tear shapes using the tips of her fingers. Then children could be invited to try it out on their own papers. While they are cutting and tearing, the teacher could gently show individual children how to turn their scissor to make the cutting easier while she marvels at the multitude of shapes that are being created. Scissors could be collected and each child could be given a zip-loc bag labeled with his/her name and told that they were going to get their bags back tomorrow for something very exciting. Children could then return to the meeting area to share their responses to the activity and their ideas about what might be happening tomorrow. The next day the teacher could return to her own zip loc bag and another colored paper (different color) and demonstrate how she arranges and rearranges her cutouts to make different kinds of designs, reacting out loud to her various designs so as to publicly share her thoughts with the group. Children could then each pick their own second sheet of colored paper, be given their baggies filled with cutout shapes from yesterday’s activity and go off to make their own arrangements. Talking, sharing and laughing at work tables is encouraged! Once again, the shapes are returned to baggies, paper collected and children reconvene at meeting to discuss their experiences. Tomorrow they would get their baggies back for something very exciting! The third day, the teacher could once again model arranging and rearranging her shapes but this time she would decide on one that she was particularly pleased with. Now she could demonstrate how she takes each shape, one at a time, and glues it to the paper so that she has a completed work of art. Children are now challenged to find their most pleasing design and to glue it to their papers. If this work were displayed for the group to see, the discussion would probably be so much richer than any discussion about a series of identical flowers. The children have had experience cutting and pasting without the anxiety of keeping within the lines or making something look ‘just right’. They also would have had the pleasure of creating and sharing art that is uniquely their own. Classrooms should have a neat and well-stocked art center that children can use independent of the teacher. All that is needed is a bookcase (I’ve sometimes used four milk crates tied together when I didn’t have a bookcase available) containing selections of paper, scissors, glue, crayons, perhaps some colored yarn, small mirrors, interesting found and recycled materials, chalk or pastels, watercolors, a basket of books with art reproductions, a small container of attractive art reproductions and museum postcards. New materials could be added throughout the year. If the teacher takes time, when needed, to introduce new materials or some strategies for using materials (i.e. paper-folding, clay creations, wood sculptures, collages, crayon etchings…) children can visit the art center at Choice Time and have the opportunity to go on their own artistic journeys. In this exciting classroom, the teacher takes on the role of a travel guide, encouraging children to make discoveries in an environment that invites experimentation and creativity. Investigative learning can be messy, filled with trial and error experiences. It can be frightening for a teacher to give up the control that comes with whole-class, directed lessons that have clear, expected outcomes. Teachers who encourage inquiry and investigative play are always actively observing and assessing the progress of children. They take time to plan carefully for centers that both welcome and challenge children’s intellectual, social and academic growth. Bumps or turns in the road are welcomed as indicators of curiosity and are seen as wonderful possibilities for enriching and extending the curriculum. In my next entry, I’d like to discuss some ideas for employing Choice Time centers for exploring one inquiry topic. I welcome ideas and stories from your classrooms! This entry was posted in Investigating Choice Time: Inquiry, Exploration, and Play and tagged art, creativity, enrichment, messy on October 4, 2010 by Renee.